Admin now includes a left-side navigation bar. You can now add your Organization’s Location information in Admin > Organization Information, and Denovo supports Multiple Locations. Added the ability to quickly copy the address for each location. Clicking on the Pages icon to the left of the Physical or Mailing address will copy the related address. Users can now be assigned to an Organization Location, and New Users can be created with the Location selected. The Ability to add New Users has been relocated to Admin > User Management. Added the ability to create new User Roles. As a caution, User Roles will show under the Contact tab in People and Matters; however, only the Role of Attorney will show for the Attorney options, and only Paralegal will show for the Paralegal options. We will be adding display groups to allow you to assign other Roles to display in those fields if needed for your organization. Note User Roles can be added by any User, but they can only be assigned by the Org Admin User. Added the ability to delete User Roles. Note that you should NOT delete the Org Admin User Role as this is necessary for your system. We will remove the ability to delete the Org Admin User Role in a future release. Added the ability to delete Users from the system. Note that the email address associated with the User is archived; therefore, the email address cannot be currently utilized for a new User account. We will add the functionality to use the email address again at a later date. Until then, please do not delete a User unless you really do not want them to have Denovo access. (Note we can retrieve and reinstate them for you if needed). Added the ability to set Default Rates by Role. This was previously set for Attorney and non-Attorney Users at the Organization level. Note that the default rate will need to adjusted to ensure your Time records are accurate. Navigate to Admin > User Roles, and click the Pencil Icon to edit the Default Rate to the appropriate rate for each Role. Users assigned to multiple roles, such as Attorney and Org Admin, will have their Time rate default to Attorney. The Denovo main menu has been simplified for ease of use. Dashboard, People, Matters, and Admin tabs remain unchanged, and Recent Items (Star Icon) and Time (Clock Icon) elements are now enlarged. Account and Logout are now located on a secondary menu display. 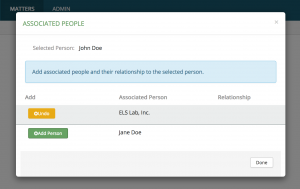 When creating a New Matter from a Person record, a pop-up window now provides the option to add any Associated People and their relationship to the Person to the new Matter along with the original Person. Matter Details are displayed using a larger font and more color contrast to aid viewing of relevant Matter information. The Matters Index and the People Index has been updated for a more streamlined look and feel. Filtering options are moved into the table. CSV Export updated to include Payee column in place of all Matter Associated People. To edit Billing Status, click the Pencil icon, and manually change the Billing Status from Unvoiced to Invoiced, then again to Paid, for each Time Card. Click Save to retain changes.